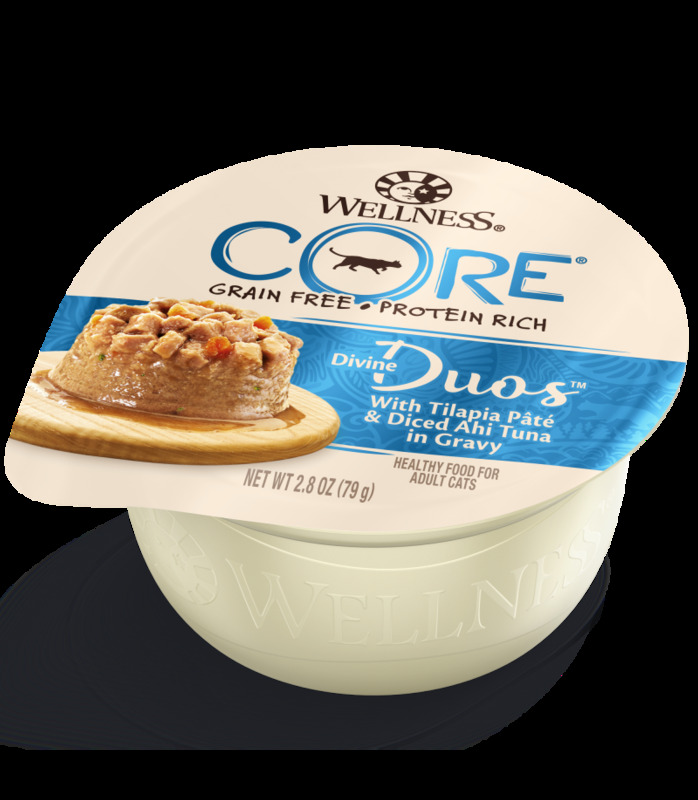 Wellness® CORE® Divine Duos™ combines two tasty layers in one cup! With a layer of savory pâté topped with a second layer of tender cuts in gravy, this grain-free protein-rich meal provides an elevated everyday meal experience. Chicken Broth, Water Sufficient for Processing, Chicken, Potato Starch, Tilapia, Ahi Tuna, Carrots, Chicken Liver, Eggs, Natural Flavor, Broccoli, Salt, Potassium Chloride, Tricalcium Phosphate, Guar Gum, Taurine, Xanthan Gum, Locust Bean Gum, Sodium Carbonate, Magnesium Sulfate, Vitamins [Vitamin E Supplement, Thiamine Hydrochloride, Niacin, Vitamin A Supplement, Pyridoxine Hydrochloride, d-Calcium Pantothenate, Riboflavin Supplement, Folic Acid, Vitamin D3 Supplement, Biotin, Vitamin B12 Supplement], Choline Chloride, Minerals [Zinc Amino Acid Chelate, Iron Amino Acid Chelate, Manganese Amino Acid Chelate, Copper Amino Acid Chelate], Potassium Iodide, Sodium Selenite. Wellness CORE Divine Duos With Tilapia Pâté & Diced Ahi Tuna in Gravy is formulated to meet the nutritional levels established by the AAFCO Cat Food Nutrient Profiles for maintenance. Feeding Alone: About 3 containers per 6 - 8 lbs body weight daily. Feeding with Wellness Dry: Reduce dry by ⅛ cup for every 1 container wet. Every cat is a little different, so optimal feeding amounts may vary with age, size, activity level, breed and environment. Please use feeding guidelines as an initial recommendation and adjust as needed. Always refrigerate unused portion. This delicious version of a French classic will convince your cat they are dining in the finest restaurant with ingredients like tender chunks of tuna, peas, cranberries, green beans, and anchovy. The satisfied purrs you hear after serving this dish will translate to a happy "Merci!". This is a recipe truly fit for royalty - especially the feline kind. We start with tender chunks of chicken and add peas, potato, cranberries, and spinach for a deliciously creamy and satisfying meal. This elegant classic is sure to please. Pâté’s are a full-flavored gourmet cuisine sure to please your feline family member, as well. Made with love from our kitchen and featuring deboned turkey as the first ingredient, Merrick Grain Free Purrfect Bistro Turkey Pâté contains no artificial colors, flavors or preservatives. It does, however, contain a delightful recipe that your cat will love. Pâté’s are a full-flavored gourmet cuisine sure to please your feline family member, as well. Made with love from our kitchen and featuring deboned duck as the first ingredient, Merrick Grain Free Purrfect Bistro Duck Pâté contains no artificial colors, flavors or preservatives. It does, however, contain a delightful recipe that your cat will love. Pâté’s are a full-flavored gourmet cuisine sure to please your feline family member, as well. Made with love from our kitchen and featuring deboned chicken as the first ingredient, Merrick Grain Free Purrfect Bistro Chicken Pâté contains no artificial colors, flavors or preservatives. It does, however, contain a delightful recipe that your cat will love. This fancy French-inspired recipe will become a new favorite for your feline companion. We make ours with tender chunks of chicken, peas, cranberries, broccoli, and cheese. Will your cat love this scrumptious take on a timeless recipe? Oui! No artificial colors, flavors or preservatives. Our classic chicken casserole will have cats all over the neighborhood meowing in delight. We start with tender chunks of chicken, chicken liver, tuna, peas, and cranberries. The delicious aroma - made with love from our kitchen - is sure to bring your favorite feline purring to the table. Contains no artificial colors, flavors or preservatives. The mouth-watering shredded Thanksgiving Day Dinner™ recipe starts with deboned turkey, then piles on sweet potatoes, carrots, peas, and cranberries for a delicious meal year-round. Purrfect Bistro Thanksgiving Day Dinner™ Canned Cat Food contains no artificial colors, flavors or preservatives. Grammy's Pot Pie™ shredded recipe is prepared with chicken, sweet potatoes, carrots and cranberries. Purrfect Bistro Grammy's Pot Pie™ Canned Cat Food is 100% grain free and contains no corn, wheat, soy, glutens or artificial preservatives. Schesir in Jelly offers your cat a healthy diet made with great-tasting, specially-selected Pacific tuna or premium chicken. The taste, smell and consistency of Schesir wet cat food is irresistible, even to the pickiest pets. Schesir in Cooking Water are a nutritious complete food for cats, containing all the vitamins and minerals required for a long and healthy life. They are extremely palatable and contain only the highest quality ingredients. Schesir Kitten offers your kitty a healthy, balanced and natural diet. Schesir Kitten has been specially developed to meet the nutrient requirements of kittens and growing cats, and promotes a healthy and long life. The taste, aroma, and texture of Schesir are irresistible, even for the most fussy of feline palates. Schesir in Natural Gravy is a delicious grainless treat for your cat. It is made using only the best, wholesome ingredients and provides your cat with a wide selection of complementary foods all of which add variety and flavor to the daily menu. It is completely free from artificial preservatives and colors.